Less than 25% of American adults eat the recommended 7-13 daily servings of fruits and vegetables. There is no substitute for eating a wide variety of fruits and vegetables, and if you are like most people, you don’t eat enough fruits or vegetables or enough variety. 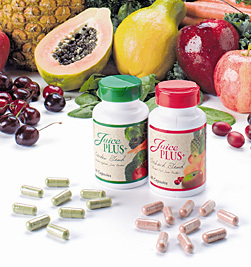 What I like about Juice Plus+ is that their products, The Orchard Blend, Garden Blend and Vineyard Blend, are whole food based nutrition from 25 vegetables, fruits and grains, in easy to swallow capsules or chewables for adults and children. They are convenient, inexpensive and the most widely researched nutritional products, with independent clinical research studies conducted in leading hospitals and universities by investigators in the United States, England, Australia, Austria, Italy, and Japan. Several studies have shown that the levels of antioxidants in the bloodstream are increased significantly in as little as 28 days after starting to take Juice Plus+ on a daily basis. Other published clinical studies have shown Juice Plus+ products to support the immune system, reduce damage to DNA, and improve cardiovascular health in various ways. It’s the next best thing to fruits and vegetables…because we simply don’t get enough of the real thing every day. For more information about the products, clinical research or to place an order click here.